The Kurdistan Region of Iraq is bordered by Turkey in the North, Iran in the East and Syria in the West. It is divided into three governorates: Erbil, Duhok and Sulaimani, with each of them having their own capital city of the same name. 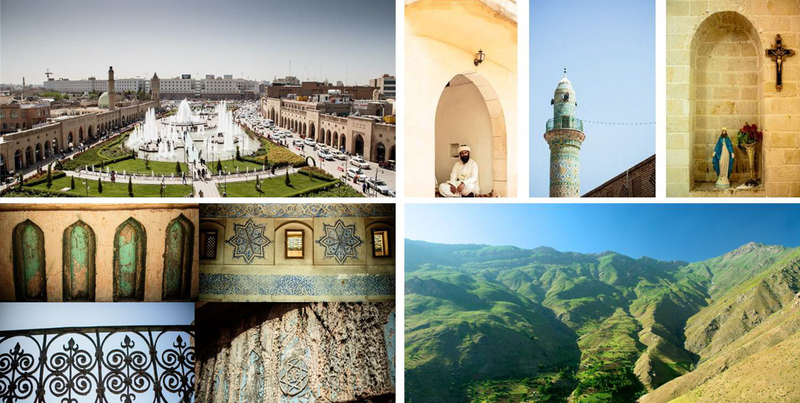 The capital of the entire Kurdistan Region of Iraq is Erbil. Kurdistan is geographically and climatically diverse. Hot and dry summers, where temperatures can climb up to 40C°, as well as wet and cold winters are common. Because of its mountainous landscape, Kurdistan offers a variety of cooler holiday destinations that are ideal getaways from the hot cities on weekends. The picturesque mountain regions are covered with lush forests. The highest mountain in the Kurdistan Region is the 3360m high Halgurd, situated in the eastern part of the Region. Previously known as breadbasket of the region, Kurdistan benefits from fertile soils and rich water resources. The rivers Sirwan and Tigris, as well as their arms Great and Small Zab, provide ample irrigation and are also ideal destinations for day trips. With a relatively low unemployment rate of 6% (2012) and a GDP of 23.6 million USD (2011), the Kurdistan Region has been experiencing a tremendous economic boom. The service sector, accounting for 30.1% of the GDP, is its largest sector. This is followed by public services (20.6%), agriculture (17.5%), trade and transport (13.5%), mining and industry (9.4%), construction (7.6%) and banking and insurance (1.3%). Foreign investors from Turkey, Lebanon, as well as from European countries such as Austria, are active in the Region. Apart from the flourishing oil and gas sector, investments are particularly welcome in the areas of agriculture, industry and tourism. Infrastructural development has increased remarkably in the last decade. International airports are situated in Erbil and Sulaimani and a stable power network is well established across the Region. The Kurdistan Region has over 5 million inhabitants. The annual growth rate of the population between 2011 and 2012 was 3%. Approximately a third of the population is under 25 years of age. The Region is home to a variety of ethnic groups. While Kurds account for the majority of the population, Assyrians, Chaldeans, Turkmen, Armenians and Arabs also live within the Kurdistan Region. The composition of the population in the Region has changed significantly over time. Under Saddam Hussein’s Arabization program, hundreds of thousands of Kurds were displaced or relocated. After the withdrawal of Iraqi troops in 1991, people increasingly migrated into the Region’s cities. The growing urbanisation contributed to a general shift from subsistence farming to increased employment in the trade and construction sectors. The official languages of the Kurdistan Region are Kurdish and Arabic. Moreover, a variety of Kurdish dialects are spoken. The most frequently spoken ones are Sorani, spoken in Erbil and Sulaimani, and Kurmanji, common in Duhok. Less common dialects are Hawrami and Zazaki. The Assyrian-Chaldean community mainly speaks Neo-Aramaic and the Turkmen community usually speaks Turkoman. The various schools and universities reflect the linguistic diversity of the Region. Classes are held in the various languages common in the Kurdistan Region but English schools and universities are also gaining in importance. Religious diversity is an integral part of the new, pluralistic Kurdistan Region, where minorities are protected and all religions can be practiced freely. A majority of the population are Muslims, with Christians also making up a portion of the population. The Yezidi community has its origins in the Kurdistan Region and their holiest shrine, Lalish, is situated in the Duhok governorate. All religions live together peacefully in mutual respect of each other’s values in the Kurdistan Region of Iraq.